Welcome to our large and comprehensive London Islington branch, conveniently situated just a short walk or one stop on the Tube from London's Kings Cross Train Station, just on Caledonian Road. We are open every day so you can choose when to pick up and drop off your hire car based on what's convenient to you. You can browse our services online at any time to explore which car is right for you and then add on any extras or tweak your rental terms such as including a second driver for the hire car. This ensures a personalised service to suit all needs so that we have happy customers. Please note that, although our branch does lie outside the London Congestion Charge Zone, hire cars do need to pay the charge and you will need to arrange this if you drive into the city centre. Chat to our staff in-branch to find out more or visit Transport for London to pay. When renting a car from Sixt King's Cross, you can expect third party insurance and adaptable mileage packages as standard. Perfect for tourists: while Kings Cross is a thriving transport hub with a cosmopolitan vibe, there are many other places to explore just a short drive away; such as Hyde Park and London's historic Docklands area. Further afield, the A1 runs close to Kings Cross, affording customers easy access to Watford, home of the world famous Harry Potter studio tour. Those living in Kings Cross looking for van hire London, perhaps to move home or transport furniture, can also turn to the local Sixt offices for great customer service at an affordable price. 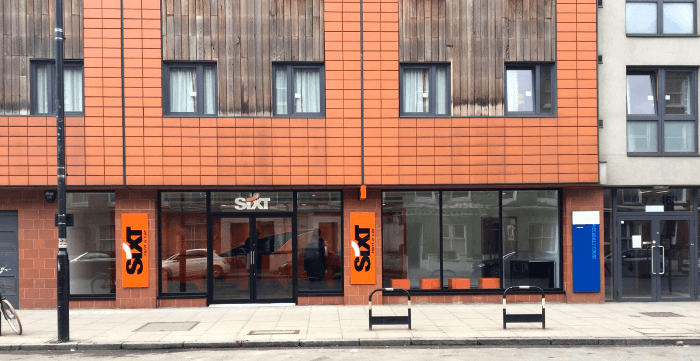 The Sixt branch is located only one minute walk from the Caledonian Road tube station. Upon exiting the station, please turn right and you will see our Sixt branch on the right. Please note that our Sixt vehicles are parked at Brewery road station which is only 3 minutes walk from the branch. If you are returning the vehilce at Sixt Caledonian Road Station, please note that our return area is located at 1 Brewery Road, London N7 9QJ From Kings Cross 1. From Kings Cross Station head north onto York Way. 2. Follow the road for approximately 1 mile until you arrive at a set of traffic lights at a cross junction then turn right onto Brewery Road. 3. Continue all the way down Brewery Road, 4. Sixt is located at the end of the road on the right hand side. From Holloway Road 1. Enter Camden Road from Holloway Road 2.	immediately bare to your left onto Caledonian Road. 3. Continue on Caledonian Road for approximately ¾ of a mile whilst passing three sets of traffic lights then take your first right onto Brewery Road 4. Sixt will be on your left. Please note that our return area is located at 1 Brewery Road, London N7 9QJ. Park the Sixt vehicle on the street, and drop the key inside our keybox which is located next to the door/gate.